Ever since I got my Motorola Droid 4 it has randomly turned itself off multiple times a day. It's not a software crash, it's not the power button getting stuck down or bumped in my pocket. It's the stupid battery! The Droid 4 has a fixed battery that you can't remove, yet somehow they made it so the battery could easily lose its connection. To test this I removed the back cover, you need to stick a pin in the hole at the top right of the back to remove the cover. With the cover off I poked at the battery, I found that if I pressed the top left of the battery it would cause the bottom right of the battery to lift up and lose its connection, and the phone would shut off. 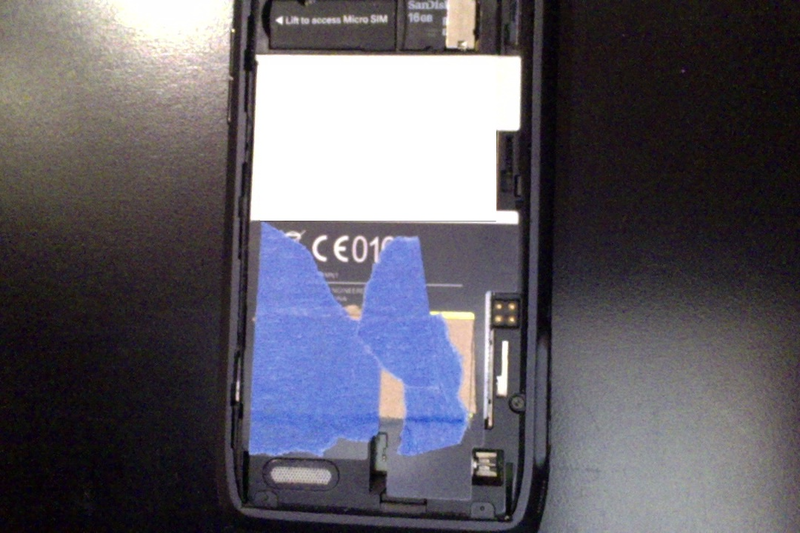 To fix this I folded up some paper and taped it to the bottom of the battery and replaced the back cover. My phone hasn't powered off in days! If you try this you might want to pick some materials that aren't flammable, I just used what I had lying around.